Join the ANNOUNCEMENT e-mail list (TangoCafeNews). Join the DISCUSSION e-mail list (TangoCafeFriends). Join this too if you want to SEND messages. Take a look at ways to help. --------------------→ install a Quicktime plugin (Firefox) and turn on your sound. Flyer, two-sided. (includes photos). Please distribute this far and wide! Flyer, one-sided (for windows and telephone poles). • Argentine food, coffee and mate (mah-tay). • A venue for Latin American music. • A venue for dance, art, and poetry. Today the Tango Café is threatened by a 50 million dollar development at the corner of Murray and Forward Avenues. The project will raze the building that houses the Café. The Friends of the Tango Café are working to ensure that the Café survives. 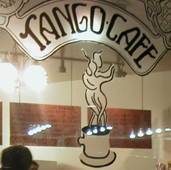 The Tango Café family currently provide to Pittsburgh a unique and irreplaceable cultural and educational experience, reaching far wider than its modest size and economic impact would hint. The café required great sacrifice and intense work to launch. It still requires hard work seven days a week and persistence. It provides little margin for a livelihood. But it is home for the family and for their community of customers and friends. Therefore the prospect of eviction to make room for the new development is frightening. Those of us who love Tango Café and recognize its value to the city intend to do what we can to assure its continuity. Visit the Café at 5806 Forward Avenue. Taste an empanada! Join Friends of Tango Café. Sign up for news updates and calls to action. Call your City Councilman, representative and other city leaders. Say a word for economic justice and for preserving a beautiful Pittsburgh cultural resource. If you care about culture and diversity in Squirrel Hill, call local leaders, urge them to help. Steve Hawkins, Squirrel Hill Urban Coalition President. (412) 521-9399. Dan Frankel, State Representative. (412) 422-1774, (717) 705-1875. Suggest a great new location. Help identify bridge funds to survive the transition. Send e-mail to tangocafe1@yahoo.com.ar with your ideas. The builder, R.E. Crawford, has been working closely with the Tango Cafe to locate new space. We believe this to be a good faith effort, but it may not be enough. Alliance with a Latin American cultural organization, existing or new, is being considered; this could be an effective way to attract grant funding. The next Zoning Board meeting will take place in early October. Links to articles on the battle for the Tango Cafe. Jewish Chronicle - "Tango Cafe fighting for its existence"
Jewish Chronicle - "Tango Café searching for a new home"